KIEV, Ukraine -- Nearly four years into a grinding war against rebels armed by Russia, Ukraine’s Defense Ministry proudly announced last month that it had improved its previously meager medical services for its wounded troops with the purchase and delivery of 100 new military ambulances. 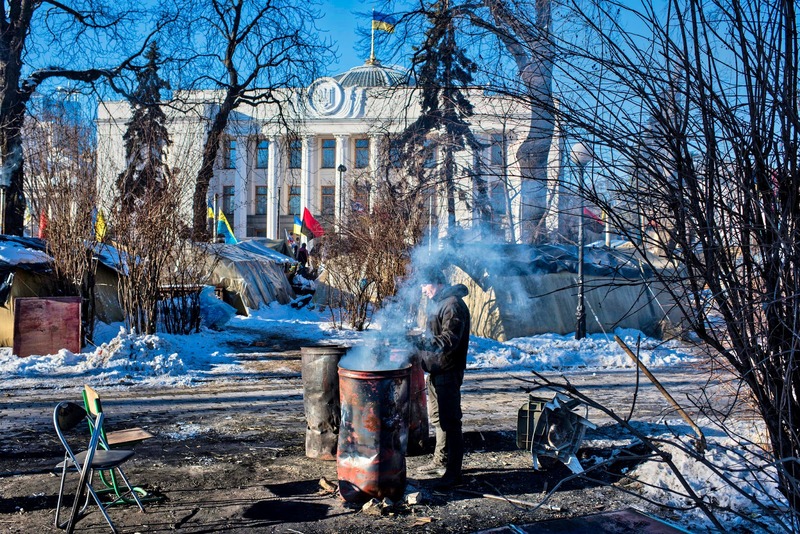 Supporters of Mikheil Saakashvili, the former president of Georgia, have joined angry veterans of the war in the east in a protest encampment outside the Ukrainian Parliament in Kiev. Not mentioned, however, was that many of the ambulances had already broken down. Or that they had been sold to the military under a no-bid contract by an auto company owned by a senior official in charge of procurement for Ukraine’s armed forces. Or that the official, Oleg Gladkovskyi, is an old friend and business partner of Ukraine’s president, Petro O. Poroshenko. Ukraine’s spending on defense and security has soared since the conflict in the east started in 2014, rising from around 2.5 percent of its gross domestic product in 2013 to more than 5 percent this year, when it will total around $6 billion. This bonanza, which will push procurement spending in 2018 to more than $700 million, has enabled Ukraine to rebuild its dilapidated military and fight to a standstill pro-Russian rebels and their heavily armed Russian backers. But by pumping so much money through the hands of Ukrainian officials and businessmen — often the same people — the surge in military spending has also held back efforts to defeat the corruption and self-dealing that many see as Ukraine’s most dangerous enemy. The problem has throttled the hopes raised in February 2014 by the ouster of Ukraine’s notoriously corrupt, pro-Russian former president, Viktor F. Yanukovych. 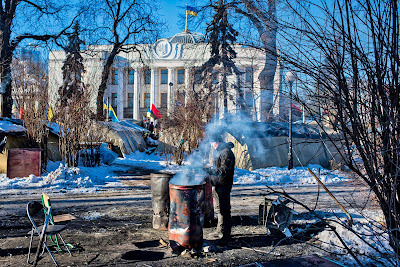 It has also left the country’s dispirited Western backers and many Ukrainians wondering what, after two revolutions since independence in 1991, it will take to curb the chronic corruption. “It serves no purpose for Ukraine to fight for its body in Donbass if it loses its soul to corruption,” Secretary of State Rex W. Tillerson warned last year, referring to regions of eastern Ukraine seized by Russian-backed separatists after the ouster of Mr. Yanukovych. Ukraine has made considerable progress since 2014 in draining pools of corruption in the gas business, a major source of income for crooked tycoons under Mr. Yanukovych. It has overhauled the state energy company, Naftogaz, and reduced the scope for corrupt gas deals by insiders by cutting its reliance on supplies from Russia’s energy giant, Gazprom. Military spending, however, has opened up new vistas for opaque insider deals, sheltered from scrutiny by a cone of secrecy that covers the details of military spending. “Corruption in the energy sector has been reduced, so some of the main avenues for corruption have moved to defense,” said Olena Trehub, the secretary general of the Independent Defense Anti-Corruption Committee, a research group funded by Western donors. While Mr. Gladkovskyi acknowledged that the ambulance purchase did not involve an open tender for bids, there is no evidence that he tilted military contracts for ambulances and other vehicles toward his own company, something he denies doing. But the appearance of a blatant conflict of interest is just one of many in a country where business and political power form a tangled skein of overlapping, opaque and often lucrative transactions. “There is no proof that he influenced purchasing decisions, and there never will be. It is all secret,” said Victor Chumak, an independent member of the Ukrainian Parliament and deputy chairman of its anticorruption committee. Emblematic of the intertwining of business and politics and the rich fruit this can yield are three lavish villas on the southern Spanish coast. They are owned by President Poroshenko, Mr. Gladkovskyi and Ihor Kononenko, another business partner of the president who leads Mr. Poroshenko’s faction in Parliament. All three were wealthy businessmen before taking official posts, but they have nonetheless stirred suspicion by being less than forthcoming about their holdings. None of them declared the Spanish properties in mandatory filings of assets, an annual declaration of wealth by senior officials introduced in 2016 as part of a now-stalled drive for greater transparency and accountability. Conflicts of interest are so widespread “that you are no longer even shocked,” said Aivaras Abromavicius, a former investment banker from Lithuania who helped lead a since-becalmed push for clean government while serving as Ukraine’s minister of economy and trade. Such disappointment has already cost Ukraine dearly. The International Monetary Fund and the European Union, frustrated by foot-dragging over the establishment of a long-promised independent anticorruption court and other setbacks, have suspended assistance money totaling more than $5 billion. “Ukraine lived for decades in a state of total corruption,” said Artem Sytnyk, director of the National Anti-Corruption Bureau of Ukraine, known as NABU, an independent agency set up in 2015 during an initial burst of enthusiasm for clean government following the ouster of Mr. Yanukovych. His bureau has assembled evidence in 107 cases against previously untouchable officials, but only one has ended with a court sentence. The rest are stalled in a sluggish judicial system addled by corruption and political meddling. NABU’s efforts to delve into defense-related embezzlement, which led to the arrest last year of a deputy defense minister and the ministry’s procurement chief, led to a flurry of moves to neuter the anticorruption body. NABU has come under sustained attack in recent months, with Parliament drafting legislation, later dropped, that would have emasculated the agency and with the domestic intelligence service raiding the homes of NABU employees. Mr. Poroshenko who is expected to seek re-election next year, has positioned himself as a leader who rebuilt Ukraine’s ramshackle military and stood up to President Vladimir V. Putin of Russia. To the consternation of the Ukraine leader, though, the conflict with pro-Russian separatists is slowly mutating in the public mind from a heroic struggle into yet another sinkhole of profiteering and graft. Helping along this shift has been Mikheil Saakashvili, the former president of Georgia who, until he was grabbed by Ukrainian security officers last week in a Kiev restaurant and bundled against his will onto a plane bound for Poland, had led a new political party in Kiev focused on denouncing corruption. His supporters in Kiev have joined angry veterans of the war in the east in a protest encampment outside the Ukrainian Parliament. Their tents and barricades are festooned with banners accusing Mr. Poroshenko and his business pals of thieving while soldiers are dying. “Nobody mentions Putin anymore, and the ‘P’ word now is Poroshenko,” Mr. Saakashvili said in an interview in Kiev shortly before his expulsion from Ukraine. Mr. Abromavicius, the former economy minister, who quit in fury over the backtracking on anticorruption efforts, said he did not believe that Mr. Poroshenko was profiting personally from the conflict in the east. But he said the president has left himself exposed by failing to deliver on promises to sell off his business assets or to set up a genuinely independent anticorruption court. Mr. Gladkovskyi defended the secrecy and the absence of public tenders for most military equipment, including ambulances, as necessary to prevent Russia from meddling in purchases by submitting phony bids through fake companies, which he says it has done repeatedly when competitive bidding has been attempted. Mr. Gladkovskyi said that he had withdrawn from business decisions at his auto company, Bohdan Motors, and that his only knowledge of the ambulances came from visits to the front line, where he saw his vehicles and felt proud that Bohdan was assisting the war effort. Looming large in this system is Ukroboronprom, a sprawling state conglomerate comprising 130 defense companies and employing around 80,000 people. Dmitro Maksimov, a former employee in Ukroboronprom’s control department, said shady deals in procurement were “the essence” of the conglomerate’s operations. Mr. Maksimov said he had raised this and other inexplicably high prices with his superiors, but was told to drop the matter and was later fired, a dismissal he is challenging in court. Denys Hurak, the conglomerate’s young deputy director, said he did not know about Mr. Maksimov’s complaints but acknowledged that corruption existed in the defense sector. “It is a systemic problem for the whole country, not just one sector,” he said. He said that Ukroboronprom had itself sent 200 reports to prosecutors about corruption in its ranks but that only two of these had ended up in convictions, and suspended sentences. The defense conglomerate last week announced, without explanation, the resignation of its director general, Roman Romanov. Daria Kaleniuk, director of the Anticorruption Action Center, a nongovernmental group in Kiev, said that transparency and accountability are national security issues that must be addressed if Ukraine is not only to create a functioning European-style democracy, but also to hold its own on the battlefield in the east. They would also help clarify why the military ambulances sold by Mr. Gladkovskyi’s auto company keep breaking down and why they were purchased in the first place. A report last year by the Independent Defense Anti-Corruption Committee said that each vehicle, whose chassis is Chinese made, had cost the Ukrainian Defense Ministry $32,000, much more than an ambulance imported from China would cost, and could carry only 800 pounds, far too little for a vehicle that would need a driver, armed guards and medical staff. She said that as many as 19 of the 50 vehicles so far delivered to the east were out of service. The Ministry of Defense, she added, recently decided to buy 100 more ambulances from Mr. Gladkovskyi’s auto company.